Training for Swift Boats began in 1965 at the Naval Amphibious Base in Coronado, CA. 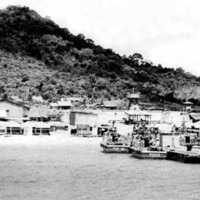 In the first year, some of the men went next to the US Naval Base in Subic Bay, Philippines to ready the Swift Boats for service. The remaining men went on to Vietnam. After arriving in Vietnam, the men dispersed to one of the following bases: An Thoi, Cam Ranh Bay, Cat Lo, Chu Lai, DaNang or Qui Nhon.